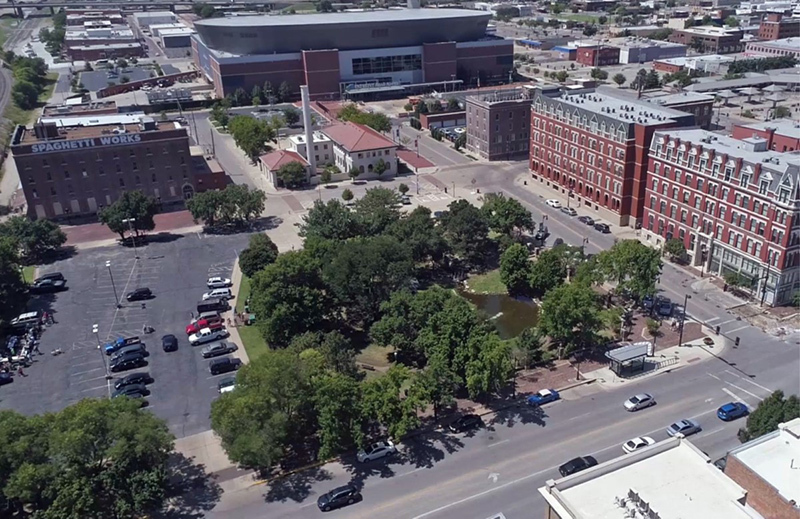 Naftzger Memorial Park was a small, pleasantly run-down city block of trees, grass, and benches, near the center of downtown Wichita, KS, just a block north of Intrust Bank Arena, recently of much-heralded (in the local media, anyway) NCAA March Madness fame. 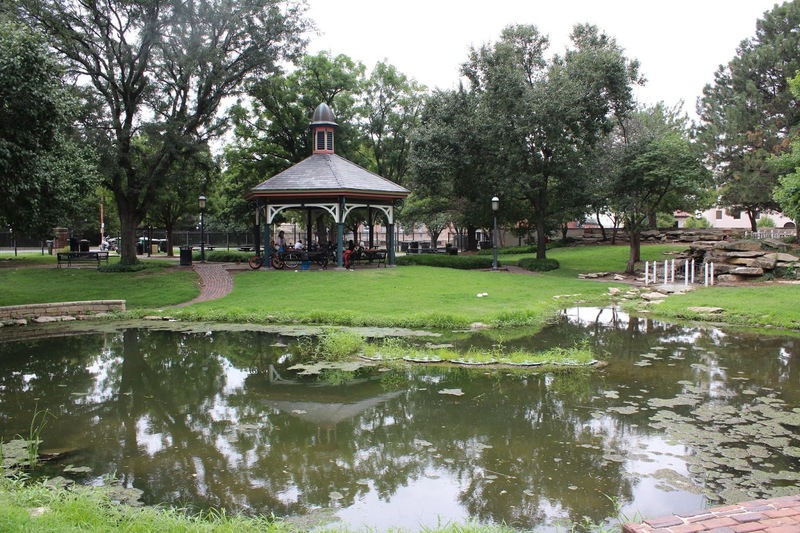 The park had a gazebo for wedding photos and a decorative waterfall that flowed into a pond that was often (though not always) kept clean of trash. 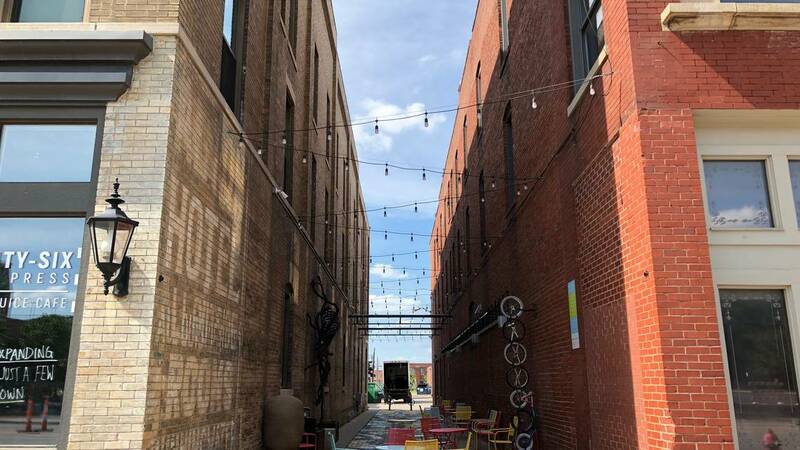 It wasn’t anyone’s example of a perfect civic space–can there be such a thing?–but it had its historic place along the Douglas Avenue, one of the main drives through Wichita’s downtown. Built on land that the city acquired in 1980, with money donated by the Naftzger family, it was a place where idiosyncratic lovers of urban landscapes, offbeat photographers, causal walkers with their brown bag lunches, and, yes, many of the city’s homeless used to gather, rest on the grass, and lean against the Carrie Nation memorial, spring and summer and fall and winter alike. That’s not a bad result, I suppose, all things considered. The new development right to its east will have an attractive (and presumably, though almost no one will say so directly, at least slightly less homeless friendly) and cleaned-up greenspace at its doorstep, the park will have a stage to host mid-sized events and a dog run for local dog-walkers and owners, and the old decorative iron fencing around it will be removed, opening it up to the “eyes on the street,” in the classic Jane Jacobs sense. Considering the sort of boondoggles that some cities have committed significant expense to in the name of enlivening their downtowns, this could have been much worse. But no, beyond all those questions, I have a more basic one: why do some of us have problems with an old park? A “worn and outdated” park, in the words or some, that was a “destination for only neighborhood residents“? An “underutilized” greenspace, in the words of others, that was lacking in “flexibility“? I don’t deny at all that public spaces, and their design, matter; we are, after all, embodied and spatial creatures, and become who we are in part through our interactions with the buildings and streets and fields and parks which make up our lived environments. But just what is this frequently felt imperative that such environments be updated, programmed, and “activated”? That’s my most fundamental question here. And the answer, I think, revolves around how so many people in cities (which means, allowing for some definitional slippage, more than three-quarters of us) find ourselves necessarily thinking about growth. Here in Wichita, the obsession of many is with the same problem which bedevils a great many mid-sized cities in America and around the world: we’re not growing, either in population (20-year projections suggest that Wichita will grow at an average of .8% a year) or in economic heft (recent employment numbers suggest only around a 1% average increase in available jobs each year)–or if we are growing, we’re still not growing at a rate sufficient to generate the increased revenue necessary to the match the obligations of our existing infrastructure. (Those same 20-year projections suggest that the city of Wichita will have $9-10 billion in repair and maintenance costs over that time period which it won’t be able to pay.) As I and others have discussed at length, the current stage of economic globalization is one which has overwhelmingly concentrated financial resources, and hence human and cultural incentives, in large (if not always solely the world’s largest) urban agglomerations. Wichita, the 50th-largest city in the U.S., is a good-sized city, but not big enough to generate the sort of gravity which would pull in those capital and creativity flows. So do we content ourselves with holding on to what we have? Ideally, yes, we would address ourselves to pioneering some kind of urban conservation or contraction, pursing a “steady-state” or “strong towns” model. Unfortunately, figuring out how to do so, when faced with the economic and political realities which characterize cities in an era of finance capitalism, is a puzzle. In any community that reaches a certain size (and leave off for now figuring out exactly what that size is or how it gets there; suffice to say that there are towns, and there are cities, and the differences between them can be persuasively articulated, even if not exactly innumerated), various cultural and economic factions will emerge. Achieving urban political power in the midst of those factions–for whatever purpose, however high-minded or venal–will almost inevitably involve building something, whether a highway or a museum or a program. Cities in the United States do not have the taxing and regulatory authority made legitimate by being handed down via constitutional channels; on the contrary, cities emerge organically through history, and are legitimated through governmental fiat (though much democratic agitation may precede that). Consequently, the policy tools available to them (especially if the city in question is not just a major urban metropolis as to be able to harness the political and economic power to make demands on the states they exist within, or the federal government itself) are generally pretty circumscribed. As a result, with broad issues of social import mostly off their table, and extensive funding mechanisms usually forbidden them as well, crudely relying upon, and then satisfying in turn, the aforementioned local factions, through the sort of construction enabled by sales taxes and subsidies and CIDs, usually becomes almost inseparable from the ordinary business of a city. The above is, reductively speaking, the story of what multiple scholars have called the “growth machine” of American urbanism. Interestingly, you don’t actually have to have real growth for that logic to take hold. 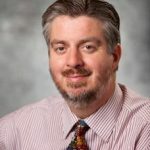 Here in Wichita, Chase Billingham, a sociologist at Wichita State University, has argued that city leaders in small and mid-sized cities will feel impelled to discover growth wherever they can, so as to be able to justify, to themselves and others, the belief (or presumption) that they are actually responding to the needs of the city–which, in the end, generally means building things. So they will, for example, invest urban guerilla pop-up parks or resurgent local symbols with sufficient meaning as to make them count as signs of growth. Which, in turn, justifies more growth, and the cycle of promotion and promises continue. Still, recognizing the way communities change and grow (if they do), in their organic, push-and-pull way, with government in the mix with all the other constituencies of the city, doesn’t mean that the very idea of a “programmed” and “activated” public space should escape critique. Because, frankly, even if the idea fits seamlessly into the reigning logic of built-on-credit American cities of today (and, for that matter, of the past couple of generations), it’s still pretty questionable as a human matter. Remember that urban communities have, most essentially, a kind of anarchist quality to them; Jane Jacobs observed that, as have many other urban scholars and activists. Planning events is one thing, but planning spaces themselves around the presumed gathering of people in coordination with planned events is, perhaps, something else entirely. The world has become thoroughly urbanized, and will only become more so, so long as resource extraction and finance capitalism continue to reign. We can work to change that, and in the meantime struggle to find alternative, more sustainable and local and democratic, trajectories for our lives and communities. But while engaged in all those important tasks, and while responsibly accepting the compromises they will have to entail, let’s hold in front of our eyes the simple fact that, whatever imperatives seem to rise up in our communities, nailing down, specifying, programming, and “activating” the public spaces in our midst needn’t be one of them. People can, in fact, gather on their own. Maybe, in such unstructured environments, the people that will gather won’t always be of the sort which will most effectively contribute to one possible economic consequence of the space in question. But we don’t live in communities to be cogs in a process of producing economic consequences–or at least we shouldn’t. We live where we do, and we become what we are through that lived environment, organically. If there is a consequence to it, it might be best, at the very least, that it not be one already determined by a planning board, because however well-meaning, their logic is likely not to be wholly their own. The park space formerly held a YMCA Rescue Mission, an X-Rated Movie Theater, and a Palm Reading Parlor among other attractions. It sat squarely in the center of Wichita’s former Skid Row, now supplanted by the Old Town entertainment district. I suppose this latest improvement is progress, but as a nostalgic old Wichitan, I guiltily wish the neighborhood could have retained some of its colorful blight…and characters. I attend as many 8tb Day events as possible. I’ve seen you speak there. I live in Abilene, Ks, now.